Baseball is what first drew me to Japan. 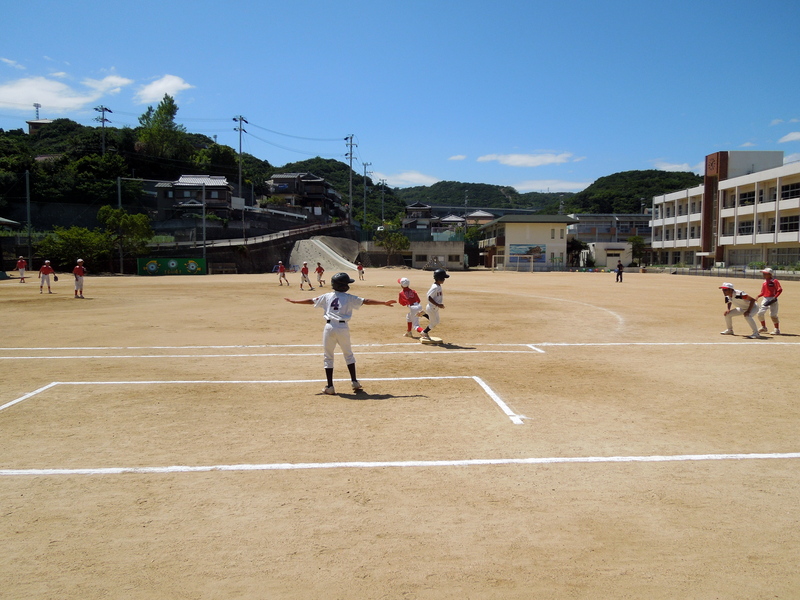 After living here for one year, I hope the following blog entry can provide a glimpse into the significance that America’s pastime has left on Japan. Before experiencing Japanese baseball, or as it’s called here, “yakyu,” I always thought baseball was played the same everywhere in the world; you have a ball, a bat, four bases, nine guys, and nine innings. Indeed, Japanese baseball possesses all of these essentials, but it also contains an additional element that distinctly molds the game to make it truly Japanese. One might describe this element as a samurai mentality, where the individual sacrifices everything for the team and never gives up. This samurai quality is called bushido, and Japan successfully incorporated this unique quality to create a style of baseball that can only be witnessed in Japan. I’m still trying to fully grasp what baseball means in Japan. Until I do, I thought it would be fun to share with you a few of my baseball experiences over here. From elementary school practices that last eight hours on dusty all dirt fields, to professional level games where opposing teams bow in unison to each other, baseball in Japan is a different breed than anything I’ve ever seen in the US. Months after I graduated college, where I played NCAA baseball, I moved to Japan for a year to teach English at two junior high schools. Within the first week, I found myself lured to my school’s baseball practice on their all dirt field. It was on this stretch of packed dirt, where for the first time, I began to understand how a tiny island nation could use it’s samurai roots in, bushido, to produce one of the greatest hitters of all time, Ichiro Suzuki. Growing up and watching the American League during the steroid era of the 90’s and early millennium, a sacrifice bunt and a high pitch count were rarely, if ever an occurence. However, I quickly discovered that both sacrifice bunting and high pitch counts, along with other differences, are a staple in the Japanese game. The first baseball game I watched in Japan. Two elementary schools compete on a dusty field. For starters, my junior high school practices at least eight hours a day in sweltering summer heat. In fact, there was a day when I arrived at 8:00 AM to the sight of the team running. At 5:00 PM, the team was still on the field, except this time they were taking batting practice. I couldn’t believe it. The team was there when I arrived at eight in the morning for work, and they were still there when I left for home, nine hours later. It got me thinking: This is just one team tucked away on a little island off the main island…how many countless other teams are out there across the country practicing all day? It also got me wondering where in this tiny island nation, rests the dusty sun drenched field with the next Japanese phenom, practicing amidst a team unassuming ball players. A good place to look for the next Japanese prospect is at the Summer Koshien High School Tournament. Perhaps the word, “tournament” is an understatement. Even after witnessing game winning hots at Fenway Park, nothing compares to the energy and spirit at Koshien. The place is magical enough to make Walt Disney jealous. And that’s just from a fans perspective. Twenty years, ago my friend won the Koshien tournament. 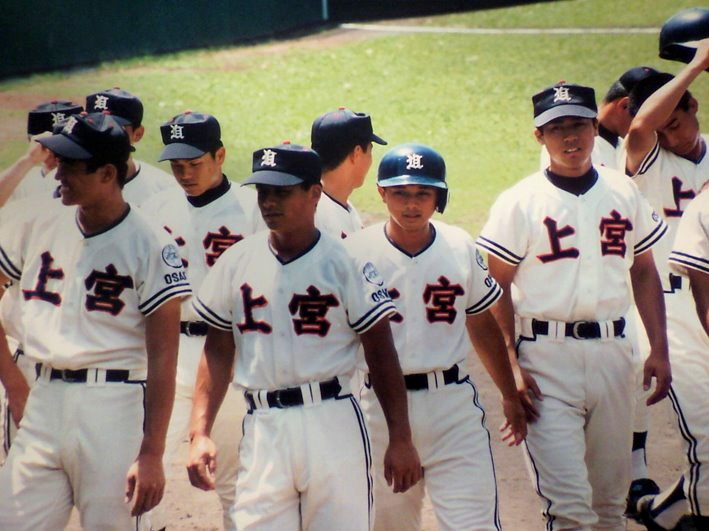 A good friend of mine actually won the Summer Koshien championship almost twenty years ago. He tells me it was the greatest achievement of his life. He was eighteen years old at the time. Now, he has a wife and two kids. And yet, Koshien was the greatest achievement of his life! That should show you how important this tournament means to people in Japan. After living in Japan for a year and learning that every koshien tournament game is broadcasted on TV, it quickly became important to me as well. Fortunately, during my final week in the country, I was able to attend a high school tournament game within the hallowed grounds of Koshien. Let me walk you through my experience. At seven in the morning with a cold bottle of milk tea, I managed to snag the last seat on my train from Kyoto Station. At prime rush hour, I transferred trains at one of the busiest stations in the world, Osaka station. Blasting through the loud speakers were instructions for getting to the game. After a fifteen minute train ride where I was pinned between baseball fans and a bunch of salary men. The train doors parted, and I joined the flood of fans rushing from the station to the ball park. I took a moment to diverge from the crowd and grab some McDonald’s breakfast to carry into the game. After all, someone’s got to live up to the American stereotype over in Japan. 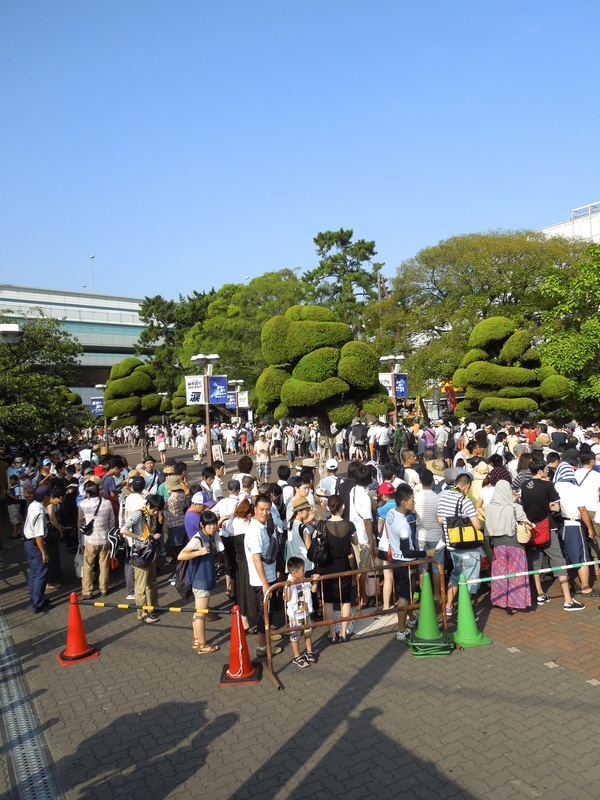 A sold out crowd of over 45,000 people wait outside of Koshien at 8 AM. It turned out admission to outfield seating was free! With my McDonald’s breakfast in hand and sweat towel wrapped around my neck, I found an empty spot in the bleachers to take in what would turn out to be one of the most memorable games of my life. The game in itself was entertaining, but the schools’ bands blasting their respected theme songs, synchronized with official school cheering teams, made for an indescribable energy. And I don’t mean a few songs and clapping here and there. The music and cheering was constant. Fans could feel the emotions that were played out on the field. There were fist-pumps, shouting, tears, and bowing, all packed into three memorable hours. The starting pitcher was a sixteen-year-old who threw 94 miles per hour. His name was Tomohiro Anraku. He undoubtably is the latest sensation to personify the idea of bushido in high school baseball. The young man threw 772 pitches over nine days last spring! When Anraku is on the mound, you better believe that honor, loyalty, dedication, and sacrifice will all display for the world to witness the unique style in which Japan approaches the game of baseball. A pitcher who hurls five complete games over the course of nine days is considered child abuse to U.S. baseball standards, but in Japan, it’s just part of the game. Not only did Anraku live up to the pitching hype, with 183 pitches thrown, but he also hit a three-run home run in extra innings to bring his team within one run of tying the game. Unfortunately, his heroic efforts fell short as, his high school from little Shikoku Island lost to a powerful team from Iwate prefecture. Tomohiro Anraku, 16, hurls a pitch in his last Koshien game of 2013. After the game, both teams rushed over to their respected sides of the field to thank their fans for cheering so loud. After bowing to their fans, the two teams lined up facing each other at home plate. Both teams recognized the high level of sportsmanship and endurance displayed throughout the contest, and on the captains’ words, bowed to each other. 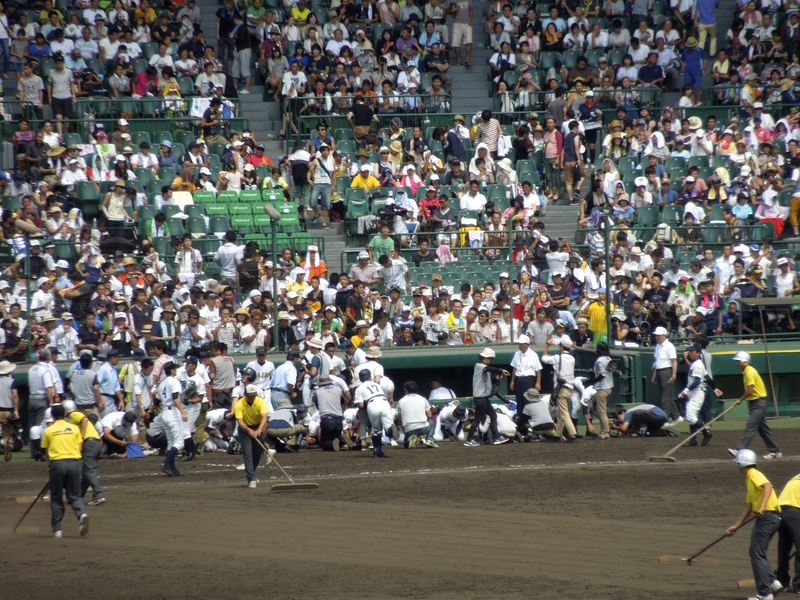 Next, the losing players scooped sacred Koshien dirt from the infield into little containers to be enshrined and cherished for the rest of their lives. As tears dripped of the defeated cheeks these boys, a storm of photographers and television cameras barreled in to record the raw emotion. You couldn’t help but feel sad for the losing players from Shikoku. It was tough to witness a team fight to the last pitch and lose. It was even harder to watch a sixteen year old labor through 183 pitches amidst 95 degree summer heat, to seemingly only come away with a dirty and sweat soaked jersey. But I have a feeling that the bushido attitude he expressed during that extra inning heart breaker, will be enough to get him back to Koshien next summer where he’ll once again have a chance to reign supreme over all of Japan. After the game, losing players scoop infield dirt to bring home. As for baseball in Japan, I have a feeling their unique style of play will not go away anytime soon. 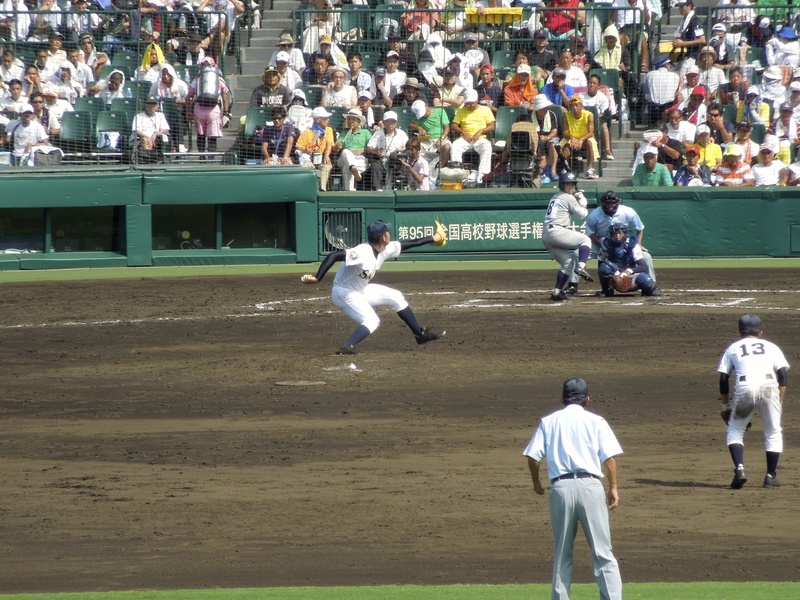 In a country that specializes in taking foreign ideas and adapting them to make them work in Japan, baseball is just another example of a tradition that may appear to have its roots in foreign soil, but after close inspection, is seen to be uniquely Japanese. This entry was posted in Baseball, Culture and tagged Anraku, Anraku Koshien, high school baseball in Japan, Japanese baseball, Japanese baseball vs. American baseball, kook yakyu, Koshien, Summer Koshien. Bookmark the permalink. Thanks for your lovely description of the baseball in Japan. Its lucky that you got to experience it live. For me, I’m just watching every baseball dorama or movie which show how much they anticipated to go to Koshien, long hour practicing everyday,crying inconsolably when defeated . Me of course think that’s only in dorama and movie. Well, now I know its certainly not drama and its happening in real life. Thanks for reading my blog! I’m glad you enjoyed learning about Japanese baseball. Really enjoy your blog. I traveled to Japan a few years ago and got to experience a baseball (Hiroshima Toyo Carp). Growing up watching baseball in the states, it was fascinating to experience the differences and to see the the passion of the fans. Thanks for the blog. Great stuff.